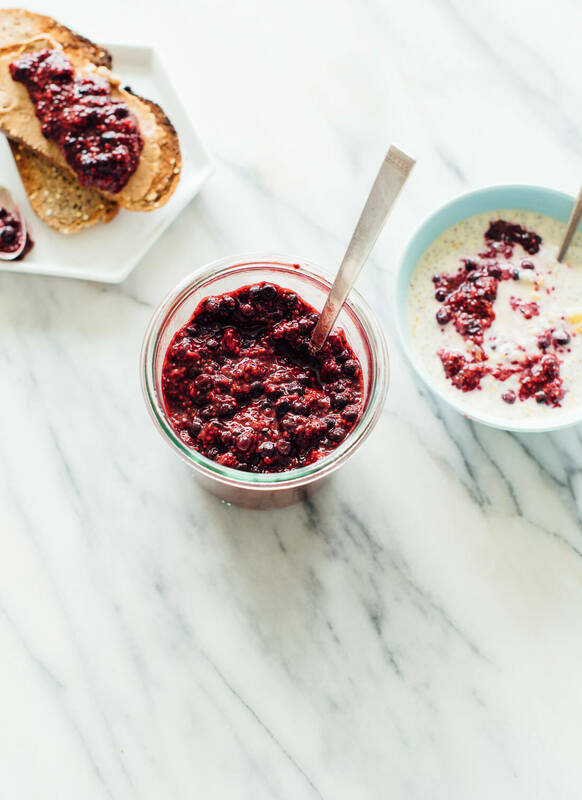 This easy chia jam is a delicious way to eat more berries on a regular basis. The recipe has been a long time coming. I received an unsettling call from the doctor’s office early last year. Don’t worry, I’m completely fine. I am, however, as neurotic as ever. I’m also a natural-born researcher, so I dove straight into the internet for more information. It’s better to do something than to do nothing, you know? I opened at least fifty tabs to read the latest research about the cancer-fighting, insulin-stabilizing, life-giving powers of whole foods. Food really can be the best medicine—or at least, the best preventative medicine. I love that blogging allows me to promote whole foods via delicious recipes. I don’t talk much about nutrition since I’m not a dietitian, but here we go! I zeroed in a fascinating phytochemical called ellagic acid, which is found in strawberries, raspberries and other (mostly red-skinned) fruit. Ellagic acid shows a lot of promise in preventing and fighting cancer, among other rather miraculous attributes. I resolved to eat more raspberries. I really don’t eat enough fruit as it is. Fresh raspberries posed a problem, though—they aren’t in season year-round, and they’re really expensive when they’re not. Have you ever spent five dollars on a tiny container of organic raspberries, only to find that they’re moldy when you get home? Majorly disappointing. Plus, I’m only one person, and sometimes fresh fruit gets lost in my refrigerator before I can get to it. One day, I tried defrosting some frozen organic raspberries in my fridge overnight. I piled them onto peanut butter toast the next morning, and I was surprised by how much I enjoyed them. Raspberries release a lot of moisture when they defrost, which lends them a natural jam-like consistency. Plus, you can buy a big bag of frozen raspberries for the same price as one little container of fresh berries. I eventually added blueberries for even more flavor and more potent antioxidants. Then, I added some chia seeds to absorb some extra moisture and make the mixture more jammy. Bonus? Chia seeds offer some extra fiber and some omega-3’s. 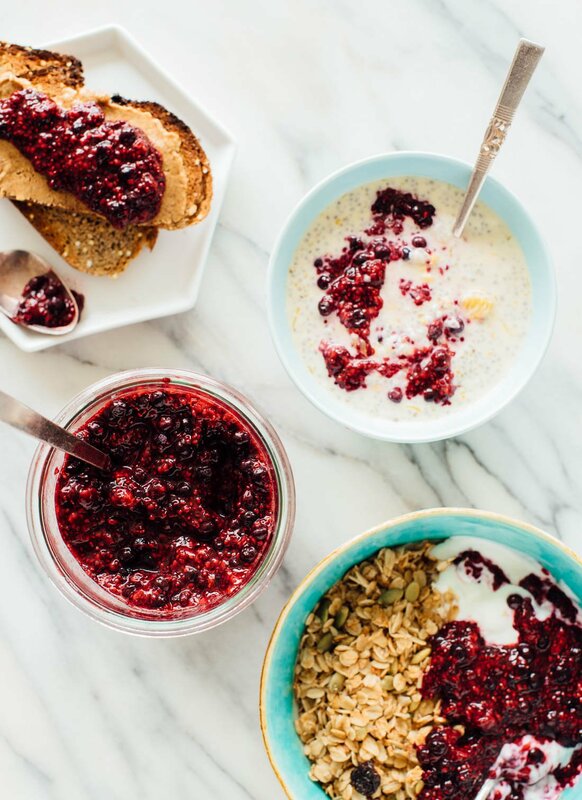 Now, my breakfasts aren’t complete without a copious amount of this berry chia jam. It’s so delicious, and I love beginning the day with a couple servings of fruit. I’m generally not great at advance food preparation, but this berry “jam” could not be easier to make and keeps well for about a week. Just be sure to factor in time for the berries to thaw (about three hours at room temperature or overnight in the fridge). This chia jam is great on toast with nut butter. It’s also fantastic on yogurt (perhaps with granola) and chia seed pudding. Try it on pancakes, waffles and bagels, too. This jam doesn’t taste like traditional, super-sweet jams because it’s made with raw berries, not cooked, and only contains as much sweetener as you want it to. I generally don’t add any, since it tastes sweet enough to me already. I’m not sure this recipe will be everyone’s “jam,” (sorry), but I love it and I’m thrilled to hear that it’s been a hit in your kitchens, too. 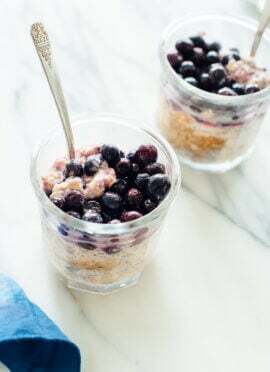 This easy chia seed jam recipe is made with defrosted raw blueberries and raspberries (no cooking required)! Eat more nutritious berries with this healthy jam. Recipe yields roughly 2 ⅔ cups. 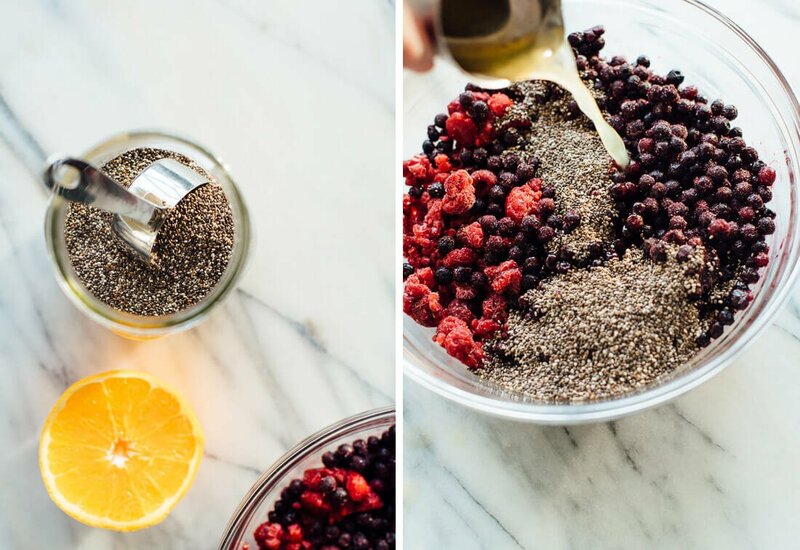 In a medium mixing bowl, combine the frozen raspberries and blueberries, chia seeds and orange juice. Cover and let the mixture defrost for about three hours at room temperature, or overnight in the refrigerator (the front of the bottom shelf in the fridge is the ideal spot for defrosting, since it’s generally the warmest area). 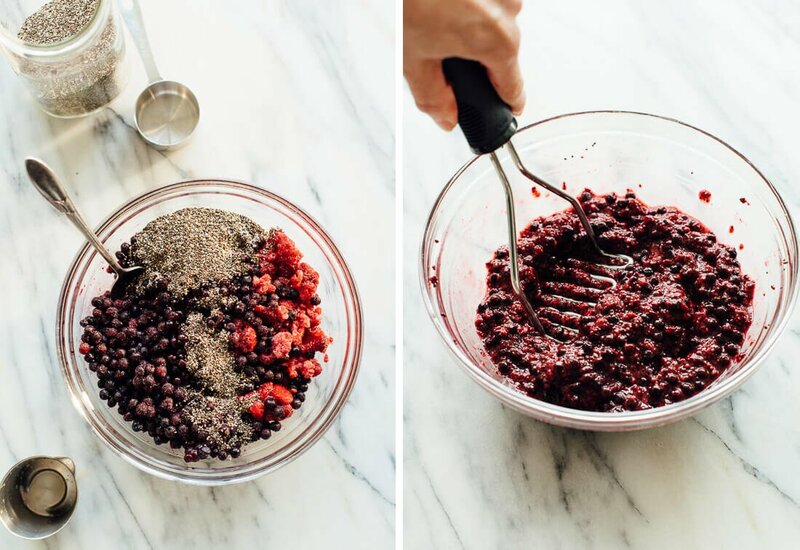 Once the berries are defrosted and soft, use a potato masher (or the back of a big spoon or serving fork should work) to mash up the mixture to your desired consistency. I like some texture in my jam, so I don’t mash it much. Taste, and if you’d like a sweeter jam, stir in some maple syrup, to taste (keep in mind that you can always just drizzle maple syrup or honey onto your jam later, if you prefer). If the chia seeds aren’t nice and plump yet, let the mixture rest for about 20 minutes to let them absorb some more moisture. I love this jam on toast/pancakes/waffles/bagels, with yogurt and granola, and in chia seed pudding. Store leftover jam in the refrigerator, covered, for about 1 week. Why buy organic? Conventionally grown berries are generally exposed to lots of pesticides while growing, so organic berries really are worth the extra expense (fortunately, frozen berries are cheaper than fresh!). Organic fruit also tends to be higher in nutrients than conventionally grown fruit (wild blueberries are even higher than regular blueberries). Change it up: You can use all blueberries or all raspberries in this recipe, but I love to use half of each. I don’t enjoy strawberries nearly as much, but they’ll work. This recipe is really designed for frozen berries, since they naturally release so much of their juices as they thaw. To use fresh berries, you would need to cook them to release enough juices; see this recipe for guidance. On canning: I am not a canning expert and have no idea if this recipe can be canned safely, so please don’t do it. It’s designed to be a simple, everyday recipe. Oh exciting! My husband and I are doing an elimination diet right now (super limited food choices) and the only ingredient we can’t have from this recipe is the orange juice. We can have pineapples so I’m wondering if fresh pineapple juice will do the trick. I’ll give it a shot and report back! This will be yummy with sun butter on a rice cake. Oh yum, I bet pineapple juice would be delicious! Hope you enjoy it. What a fantastic idea. I love it! I’m going to stop doing my work and go make some RIGHT NOW (one of the perks of working from home). Thanks for the great recipe. I can’t wait to try this! Thank you. Thanks, Erin! Hope you love it. Yum! Costco sells a wonderful tri-berry mix with raspberries, blueberries and boysenberries; I keep it in my freezer. I’ll be making this later this week! Thanks! I had the same thought… its an organic mix too! Will try it as well this weekend:) thanks Kate! PS. Your healthy muffins (apple, banana, pumpkin) are a staple in our home. They save us every time we have a sweet craving, and are on a run for breakfast. So just wanted to say, thank you! Hey Francine, about a week! Thanks, Meredith! Hope you get a chance to try it soon. Hi Kate, I did try it – made it last night and we had it for breakfast this morning. Not only is this jam easy, it’s very tasty. Since we’re in getting-ready-to-travel-mode I used what I had: some wild blueberries and mixed berries (blueberries, raspberries & black-berries). I put on Greek yogurt mixed with a little vanilla and half a scoop of vanilla protein powder; topped the whole thing with plain granola and pistachios. Definitely a keeper. And definitely worth changing up my routines for. Hi. The recipe looks so simple and easy. I do not like Maple syrup. Would honey work? Hey Liz, I love this without any sweetener, so that’s one option. Honey tends to solidify a little when it comes into contact with cold ingredients, so I think it might be challenging to mix in with the berries. However, you could always just make it without sweetener and add a drizzle of honey on top of individual servings. 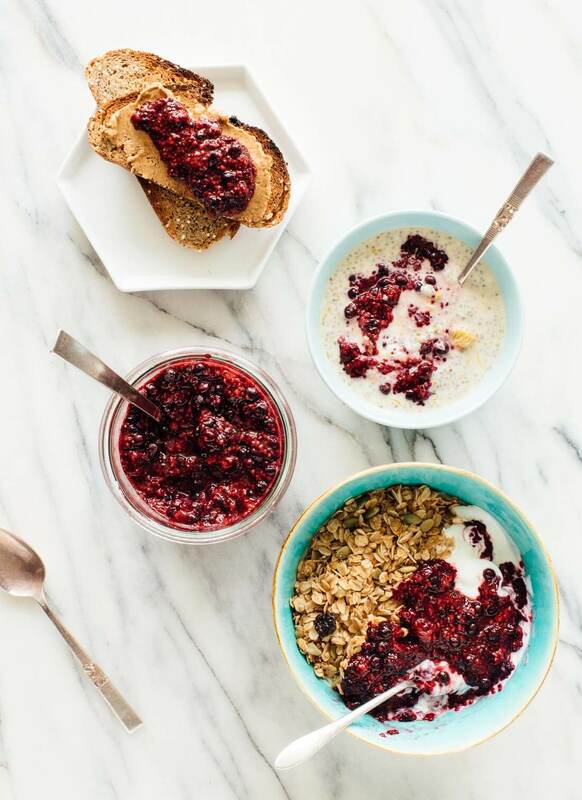 I have been making my own chia jam for years but I never thought of putting it over granola or other cereals! Thanks for the inspiration! Oh yeah, it’s great that way! Enjoy! This sounds tasty and good for at least two of my chronic health “situations” — do you think I could freeze it? I’m not likely to finish off a whole batch all by myself before it spoils. I have not tried this chia jam recipe yet, but I have successfully frozen other versions and then just defrosted them in the fridge overnight once I have used up what I have on hand. Hi Pam, you might be surprised by how quickly you can polish this off. That said, since you’re dealing with defrosting either way, I’d probably just make a half batch to start off and see how you like it. I’m thinking now I should change my own recipe and rename it ‘easy!” because this is SO SO easy to prepare! I prefer homemade chia jam to store-bought jam! I usually make a berry recipe but my favourite is with figs! Yes, the amount of variations for this type of jam is astounding. I’m looking forward to trying more :) Figs sound so good! Anna, thank you so much for your kind comment and for sharing my blog with your friends. I really appreciate it. I’m sorry to hear about your cancer risk. That’s unsettling! I haven’t had any tests run in that regard. I think good nutrition is one of our best defenses, so wouldn’t hurt to add more berries and some curcumin supplements to your current regimen! Welcome to the world of chia jam ;) There are so many different variations, too! Yum! I love raspberries so much. Their smell brings me back to summer days and long, soft sunsets…I could eat them nonstop. Except for the price tag. That stops me dead in my tracks. :) Frozen berries are a great option; like you said, economical and when the berry is out of season there’s a good chance it’s frozen counterpart may have more nutrients since it’s most likely picked when it’s ripest (i.e. : in season). Exactly! And why do I feel like I only get like, eight berries when I buy them fresh? Using frozen also allows you to make as much as you need when you need it, so you don’t have to worry about how long leftovers will keep. This is perfect with overnight oats or chia pudding. I love this recipe because I never liked jam, always found it too sweet, so this one is a keeper. I’m so glad this opened up the world of jam to you, Natalia :) Enjoy! Totally making this over the weekend!! Looks so tasty!! Let me know how it goes, Adrienne! LOVE chia jam! It’s my go to for adding a little oomph to porridges and oats. Right? Gives a great texture, and those omega-3s are so important. My mom has recently had to cut out refined sugar due to health issues. She was saying how much she missed jam on her toast in the morning.I’m looking forward to making her a batch of this! Oh, no! It’d be such a bummer to live without jam, those little daily delights really make a difference. I hope she likes this! Hey Kate! I have gone through similar health things and am super ocd so it’s not fun. I love turmeric and black pepper. I roast vegetables with them and put them on my salads. I could pretty much od on fruit, but this is a fun way to mix things up. Your roasted veggies sound delicious! I’ll have to give that a try. Thanks, pal! Hope you love it. I, too, had a life’s scare and researched cancer-fighting, risk reducing and heart healthy foods. If it had a high score in one of those categories, this girl ate or drank it! And all were homemade, etc. Love the frozen fruits and keep a supply in my freezer for a daily snack. Wild blueberries are higher in antioxidant than farmed. And sugar feeds cancer! So, I am excited about this recipe. So many others REQUIRE some sort of a sweetener! Thank you!!! Sounds like we were reading the same resources! Glad you’re staying healthy, Maxine. Rachel, I hope you both love the jam! And congrats on your soon-to-be-here second babe. So exciting! What a great way to incorporate chia! 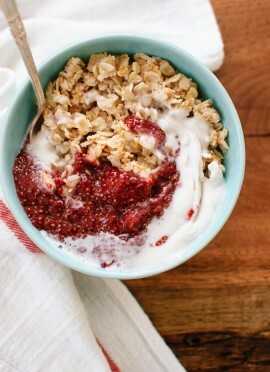 I love your Strawberry Chia Jam recipe, so I will definitely be trying this one out! Thank you, Whitney! Hope you enjoy this one! Just love how simple and delicious your recipes are! Thank you Kate! Mmmmm. This will be a great way to upgrade my morning toast with peanut butter! Thanks, Jannell! It has definitely upgraded my standard toast! This will be my go-to recipe for jam. I need to keep my sugar low, so didn’t add any sweetener. This jam is tart and I love it. Its delicious on oatmeal. I really appreciate your healthy recipes Kate! Thanks, Dianne! So glad you’re loving this one. Hi Amber! Thank you so much for reading all these years. I hope you love this jam. xo! This looks delicious and I’m so excited to make it! I was wondering if you could estimate how many cups of frozen berries make up 10-12 ounces? I don’t have a scale. Hey JP! I just made some more jam last night and added the cup measurements to the recipe. Most bags of organic frozen berries are around 10 to 12 ounces, so that’s why I offered those measurements. Hope you enjoy! I just made this and it is amazing! I added a little lemon zest because I can’t resist the lemon/raspberry combination, and it worked beautifully. 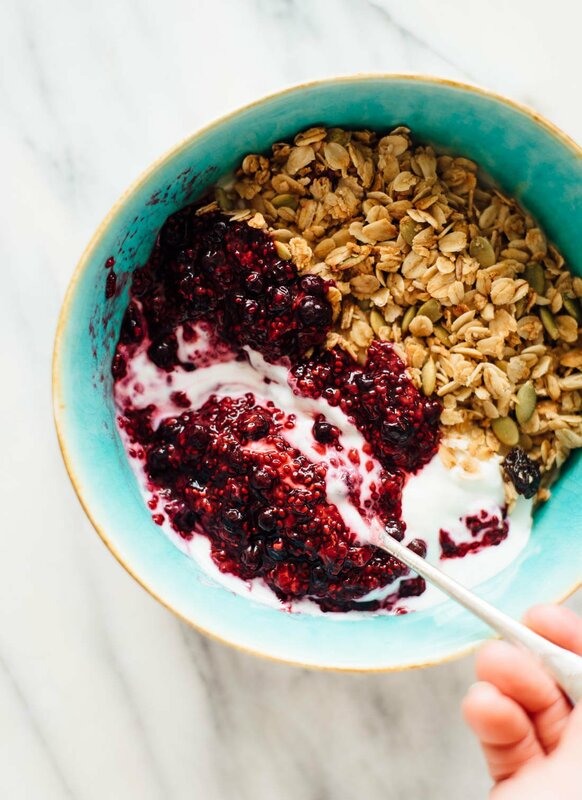 I’ve been in a bit of a breakfast rut lately, so this post couldn’t have come at a better time :) Thanks so much for another awesome recipe, Kate! Thanks, Arianna! Lemon zest sounds like a delicious addition, for sure! Urgh, my toddler is OBSESSED with berries of all kinds. Which is awesome—in the summer. But the tiny dude can polish off a Costco sized pack all on his own, so in the winter I feel like I’m deciding between the berries and his future college fund. ;) This sounds like it will be perfect!! Haha! That’s so funny. Hope he loves this jam! Just made this last night and I’m in love. So easy to make and no added sugar. 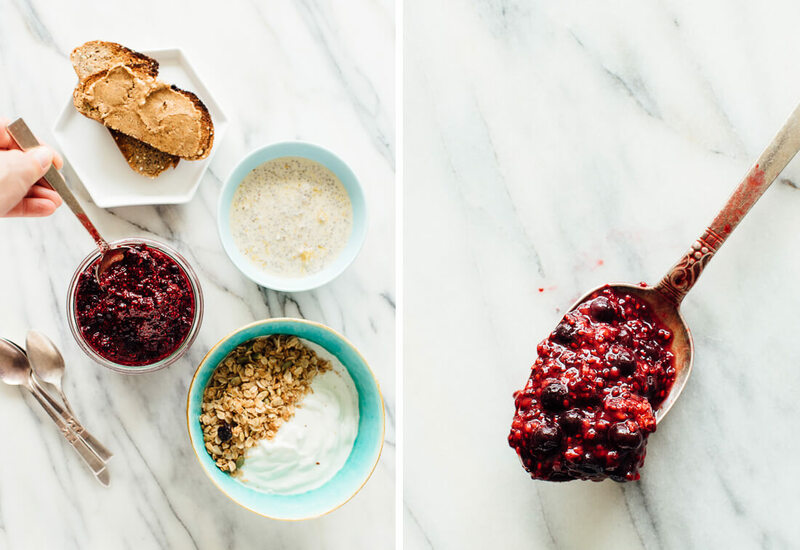 This chia jam will definitely be replacing all the jam in my fridge. So far I’ve had it on toast with almond butter & with yogurt and granola. Delicious all around!! Absolutely delicious even without any additional sweeteners! Thanks for sharing the recipe. Yes, this one is sweet and juicy all on its own :) Thanks, Kim! This recipe is fantastic! I’ve never been a fan of the sour tang from plain yogurt but just swirling this jam into the yogurt has made me fallen in love with plain yogurt! Top it off with peanut butter granola and I’m in food heaven! Too funny, I recently printed out a chia jam recipe from another website to try. I must admit I am a bit of a jam snob, having only grown up with Mom’s homemade jam, as we had a large garden. I continue to make jam. I use low sugar sure-gel, but the sugar can only go so slow or the jam won’t set. Tried a recipe using honey and it tasted terrible. Other low sugar recipes involve lots of cooking, but I prefer the taste of barely cooked freezer jam. Your no cook recipe seems like a perfect compromise. Hopefully the kids go for it. This will definetly energize me in the morning. Thank you for sharing this recipe! You’re welcome, Karen! It’s a really great way to start the day. This is absolutely gorgeous! I used a four-berry mix (strawberries, raspberries, blackberries, and blueberries), the chia seeds, and, instead of orange juice, I used a deliciously fruity, aged, vinegar. I bought the vinegar back in November and was told that it went well with strawberries – but it hasn’t exactly been strawberry season in Ontario and I’ve been searching for a way of using this yummy vinegar. It’s fantastic in this jam – gives it a delicious tartness that goes down a treat on toast with crunchy peanut butter or tahini. That version sounds positively amazing, Liz. The mix of berries is a great idea. What kind of vinegar was it, do you know? Balsamic? Where did you get the data relating to higher nutrients in organic fruits and vegetables. Most research shows little to no difference. The recipe sounds good. Hi! Here’s one study and here’s another; or in layman’s terms here and here. What an excellent, easy idea! Plus it’s so yummy! I didn’t have any chia seeds (what?!?) but used ground flax seed to thicken and it worked wonderfully! My 3 year old loves it too! We will be eating this on toast and in oatmeal all week! Yum! The flax seed version sounds really great, Anna. This recipe was life-changing! I have it with oatmeal in the morning and I add peanut butter, so it’s like PB&J oatmeal. SO good, so easy and so healthy! I just made a batch of this. DEEEEEELICIOUS! What a fantastic idea. I love it. Thanks for the great recipe. That jam and milk swirl – gorgeous! Finally bought some bags of frozen berries and got to make this last night to enjoy it this morning. Just divine on peanut butter toast! I love the natural tartness of the berries. Added a pinch of cinnamon on top too! Love this, thanks Kate! Sounds delicious, Emma! Thanks so much! PS – compared to other homemade jam recipes, this really couldn’t be easier. Such a great idea! Ditching the flavored yogurts is a challenge, for sure. I’m glad this could help you do it! I love the natural sweetness, too. I didn’t think of this as good for a pre-workout, but it sounds delicious! Hi loved your berry chia pudding! Wanted to mention, the top shelf in a refrigerator is the warmest spot. Heat rises. Thank u 4 ur site! Great point, N wa. Thanks! I’m sure this has been asked but I couldn’t find it when I scrolled back. Can I use fresh berries? and can I can this to save for later? we have a blueberry farm, we just bought, and I am looking for more ideas for blueberries. Yes, definitely! I’ve used fresh berries for this and it’s worked out beautifully. Just made this with blackberries we picked this afternoon. Added a quarter cup or so of water, plus a couple of teaspoons of stevia and ended up more than doubling the fruit. It’s come out lovely – really thick and fruity but not too sweet. That sounds absolutely delicious, Chilli! Fresh blackberries would be amazing in this. I made this jam with about a cupful of frozen cherries and added about 3 cupfuls of frozen mixed berries and 3 tablespoons of chia seeds. I defrosted the fruit, then vitamised it and added the chia seeds and popped it into the jars. Add more chia seeds if too wet. It was unbelievable – was the best jam I’ve ever had. I gave a jar to one of my foodie friends and she wouldn’t believe it was only made with 2 ingredients and no sugar (cherries adding the sweetner). It begins to water up after about 7 days so tuck in! I’m making it for Christmas gifts. What a great idea for gifts! Beautiful and delicious. Thank you so much for your comment and review. I tried this recipe with reduced honey and blended feijoa fruits. It’s a great addition to porridge and granola bowls in the morning! Thank you, Kate! SO easy and so delicious. I love it with my porridge or granola in the morning. I always make a big batch then pop them into jars and store them in the freezer! That sounds like a great combination! Thank you, Evie for your review. How could something so simple and easy be so good? I made this last night and I’ve been putting it on everything (I’ve even been sneaking spoonfuls plain, lol). I know, right?! Thank you for your review, Michelle. Thanks! I modified it a lot based on our preferences but I put 2 cups of frozen whole strawberries into a container and left them on the counter with 2TBS of chia seeds for about 3 hours. I mashed them up and added 2TBS local honey and stirred it all together. It’s delicious! I may add more chia seeds. We will be using this for almond better and strawberry jam sandwiches. Thanks! Glad this recipe inspired you! Thank you, Kina for sharing. Can you use ground chia seeds for this recipe? Hi Bri- I don’t use ground chia seeds much, or if at all. I prefer whole seeds for the texture and ability to soften with the added liquid. I wouldn’t recommend for this recipe. Hope this helps! The jam is amazing! I shared it at work and everyone else loves it, a coworker said she imagines it on top of vanilla ice cream. I imagine too! I had it on top of your almond butter, it was dry, not sure if I blended it long enough…on top of lentil bread toast. Very delicious, thank you! Vanilla ice cream and jam sounds delightful! Thanks for sharing, Sherry. I love hearing from you! Oh thank you, I’ll give it another try! You feel like you’ve done enough and figure, I guess this is as good as it gets. Thank you so much for this healthy and quick version of making jam. I’ve passed this on to my FB group ‘Super Quick Plant-Based Recipes’. I think my group will love this and your site! I loved it. It was amazing! OK, Kate, call me a crudgmudgeon, but…..I always look forward to your recipes and am rarely disappointed. But when I look at the comments to see how your readers liked the recipe and if they made any changes, all I see is: “This recipe looks great.” “Can’t wait to try this recipe”, etc., etc. I want feedback AFTER they have actually made the recipe. This isn’t exclusive to your blog but seems to be the norm with most cooking blogs. To all you Kate fans, please try the recipe first before commenting so you can actually rate it and give tips about how you substituted an ingredient or that it was perfect as written. Oh, by the way, my two standard poodles also love Cookie and your blog (and your fabulous cookbook that is chock full of outstanding recipes). Thank you, Theresa for commenting. :) I love to hear from you and appreciate all types of reviews. Of course I like to hear experiences with the recipes, but also that people are excited to try them. I’m hooked on this stuff! I ended up putting it in the blender at the end of the process because the blueberries I bought were too large for mashing. Love the consistency. This is the first time I’ve tried chia seeds. Thanks for introducing me to new foods and tastes! I love that, Janet! Thanks for sharing. I appreciate the review. Excellent! 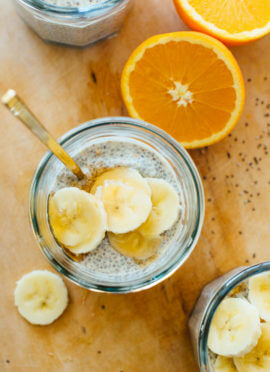 With alterations: delete orange juice, increase chia seeds to 1/2 cup. I did not use maple syrup. We serve it over Greek plain yogurt. Good over ice cream, too! I made this recipe “as is” and loved it! Decided to make it with all raspberries and substituted lime for the orange juice and loved it even more! Great way to change up my typical fruit, cereal, yogurt breakfast each day. Sounds like a delicious change! Thank you, for your review Amy. I LOVE the jam. Thank you so much and it couldn’t be easier. I didn’t add any maple syrup since I love tart flavors. I also made your almond butter and just had a delicious snack. Can’t thank you enough, this will be a staple in our house from now on. That’s a great combination, Christina! Thanks so much for sharing and for your review. So easy, delicious and healthy. I’ve only tried it on steel cut oats, but I’m sure it’d be great on just about anything. Thank you, Kate, for sharing the simple things too. You’re welcome! Thanks for taking time to tell me what you thought. I’m not a fan of maple syrup at all. Could I substitute honey for maple syrup in this recipe? It’s optional so you don’t need it, but honey may work too. Can you give me please the correct meassures to try to make your recipe as 8 ounces are 1 cup, not 10-12 ounces 2 1/2 cups, which would make 12 ounces 1 1/2 cups and please tell me if it would be still then a 1/4 Cup for the chia seeds. I think something went wrong. Hi Errol, The instructions and ingredients are correct. Let me know what you think, Laura! Hi, I made a blackboy, blueberry (frozen),apple and chia seed jam with sugar and honey mixed. Best jam I’ve made. Chia seeds are a great thickener for all sorts of recipes. Next time will add the juice and forget the sugar. Like your ideas for frozen berries as we buy these all the time. Thanks for a great jam. Sounds delicious! Thank you for sharing, Rochelle. Forgot to mention recipe: 8 cups mixed fruit:eg 7 cups blackboy peaches and1 cup frozen fruit): 3/4 cup chia seeds: 1 cup sugar (any kind) and 2 to 4 Tbs honey depending on sweetness: fruit spices: lemon juice. Chop roughly or mash half way through cooking and cook on 80 degrees for 15 minutes and 100 degrees for further 15 minutes in microwave stirring every ten. Yummy sweet and thick.